Graphic organizers or key visuals are visual displays of subject matter content that focus on how knowledge is organized. They visually demonstrate connections and relationships between key ideas or concepts using labels, arrows, boxes, etc. Key visuals help students to develop content understanding and language skills. Graphic organizers have a variety of applications for guiding student thinking and learning. This visual learning strategy can be applied in many different formats (e.g. venn diagrams, flow chart, concept maps, webs, cause and effect chart, sequence strips, graphs) to enhance understanding of curriculum content, develop language skills and provide structure for ideas. Graphic organizers can be used for large group, small group, and individual tasks as their primary purpose is to provide a structure for abstract ideas. For example, key visuals can be used to activate prior knowledge, provide structure for note-taking, and/or support grammar development. This strategy can be adapted to suit the needs of different teachers and learners. One example of this strategy in action during practicum was the use of a central theme venn diagram after reading The Wretched Stone by Chris Van Allsburg. As a class, we filled out “What the Author Says” and “What the Author Doesn’t Say” together, and then students were tasked with filling out the centre section with “The Author’s Message.” This strategy helped the students organize their thoughts, analyze the text in detail, and develop strong inferences based on evidence from the story. In this case, the key visual was used to support reading and retrieving information as well as encourage deeper level thinking. I found the idea for this Venn Diagram in an excellent inferring unit plan, Reading Between the Lines with Chris Van Allsburg, which is based on a collection of Chris Van Allsburg books (thanks Jennifer Runde!). 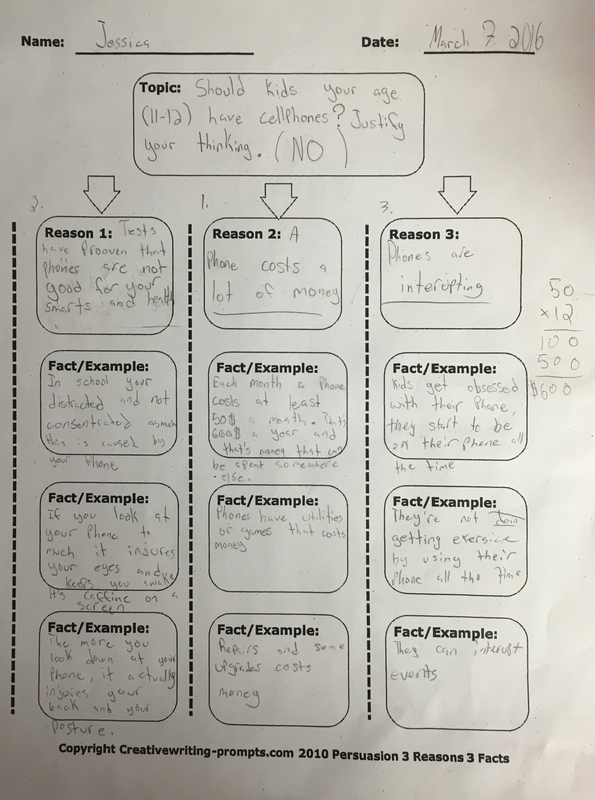 Another example of this strategy in action was the persuasive writing planner that grade 6 students used to plan their first piece of writing. This key visual was used to support written expression through overall text organization, and enabled students to produce more fully-developed writing pieces. It also helped students to see the relationships between their ideas, enabling them to form stronger arguments.